Representatives of the Sheldon Adelson-backed Coalition to Stop Internet Gambling (CSIG) and its primary sponsor, the Sheldon Adelson-CEO’d Las Vegas Sands Corporation, were a no-show today at a previously scheduled Conservative Political Action Conference (CPAC) debate scheduled to also include Poker Players Alliance executive director John Pappas. PPA executive director John Pappas is set to debate Andy Abboud of Las Vegas Sands at ‪#‎CPAC2015‬. The debate is titled “Full House: Whose Got The Winning Hand? A Debate on Internet Freedom and the 10th Amendment: Should Congress Shut Down State-Authorized Gambling Websites?” We look forward to a spirited debate and getting a chance to spread the facts! Neither Abboud nor Las Vegas Sands immediately offered an explanation for Abboud’s unexplained failure to appear, though the PPA and other pro-online gambling forces have mounted a counteroffensive to Adelson’s efforts to jam his well-funded Restoration of America’s Wire Act (RAWA) through Congress this year. However, Abboud has already been subject to a string of public embarrassments while serving as the point man for Adelson’s RAWA lobbying efforts. 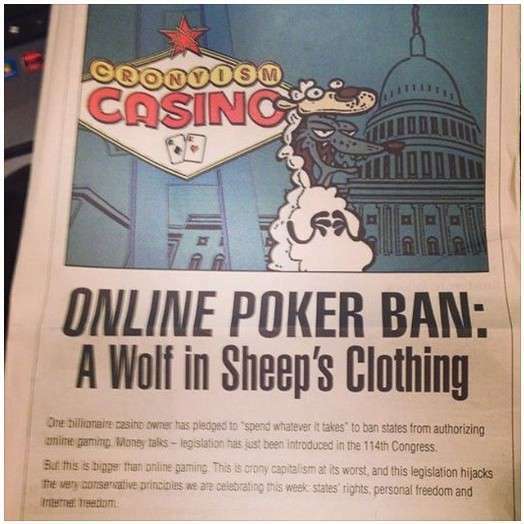 In December of 2013, Abboud suffered stinging and very public calls of blatant hypocrisy while attempting to defend puppetmaster Adelson’s calls for a federal ban on online gambling, in a Congressional hearing featuring Texas Rep. Joe Barton and others. Since then, he and other pro-RAWA forces have been hesitant to appear in open public debates on the issue. – At a forum today to openly debate the issue of a federal online gaming ban, representatives supporting the ban, fueled by billionaire casino magnate Sheldon Adelson, failed to appear. “I guess when the rubber meets the road, prohibition supporters realize they can’t back up their fear-mongering PR campaign with actual facts,” said John Pappas, executive director of the Poker Players Alliance (PPA), the leading poker grassroots advocacy group with more than one million members nationwide. “I was looking forward to an open and fair debate on the future of online gaming, and not just because the facts are on our side. Before Congress votes on any legislation that would impose a broad prohibition, like the Restoration of America’s Wire Act (RAWA), I think American voters deserve to hear both sides clearly articulate how such a ban impacts consumers, states and the economy. “The fact that the primary RAWA supporters refused to join this debate, after significant effort by the organizers, tells me that they want their bill rubber stamped instead of openly debated on the merits – a basic tenet of democracy. The debate, “Full House: Whose [sic] got the Winning Hand?” was part of the annual Conservative Political Action Conference (CPAC) held in Washington, DC. Also, the PPA released images of a new ad striking back at Adelson and his deep-pocketed pro-RAWA forces. In conjunction with the PPA’s return to CPAC, the lobbying group released an ad that appeared in this morning’s Washington Times, in which it accuses an unnamed casino billionaire [Adelson] of practicing the worst form of “crony capitalism” while attempting to run counter to the very federalist principles of government that the CPAC attendees are supposed to revere.